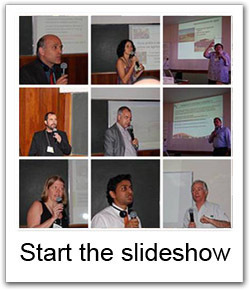 The 11th SuSanA meeting was held in Rio de Janeiro from 19 to 21 March 2010. The meeting was hosted by the UN Habitat, ABES/AIDIS, SEI and GTZ. SuSanA - UN HABITAT Dialogue at World Urban Forum - 5 (23 March) was organised to discuss the key issues in urban management related to solid and liquid waste and how they impact cities and towns. The eleventh SuSanA meeting took place in Rio de Janeiro between 19 and 21 March 2010. A short summary of the activities of each day are presented here. Day 1 (Friday): Presentations from various projects from the Latin American region. Day 2 (Saturday): Along with the working group meetings, the main SuSanA meeting in a joint plenary took place. Besides an overview on the SuSanA products (vision documents, Fact sheets, etc. ), the working groups presented the progress so far. Day 3 (Sunday): Further working groups presentations followed by discussion on the current state, future steps of the SuSanA alliance and the plans of the next meeting in 2011. SuSanA - UN HABITAT Dialogue at WUF-5 (23 March) The session discussed key issues in urban management related to solid and liquid waste and how they impact cities and towns. Note: This list of presentations is not yet complete and there is more to come in the near future. The presentation were delivered in English, Spanish or Portuguese and then translated to the audience to the respective other language. How Can We Best Share and Learn about Sustainable Sanitation - What is the Role of SuSanA - Panel Discussion?